Sacks of potatoes were awarded to all finishers in Sunday’s March Spud Run. Steve Robinson had first pick of the vegetables, as he chipped in with a well deserved victory. 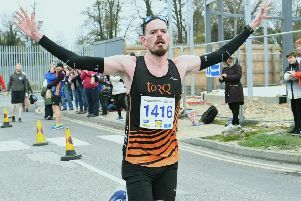 On a five-mile multi- terrain course, the 33 year-old Peterborough AC ace held off the challenge of runner-up Ben Heron from Eye Community Runners. Fifteen seconds separated the speedy pair, with Robinson crossing the line in 26:58. James Whitehead of Peterborough AC finished third, and there were plenty of local runners among the minor placings with Nene Valley teenager Jevan Robertson finishing fourth, and Kirk Brawn of Thorney and Peterborough AC’s James Sadlier both making the top 10. The ladies race was won by the prolific Philippa Taylor. The 49 year-old Nene Valley star secured her sixth race win in the past two and a half months. Taylor withstood the challenge of Ramsey Road Runner Lisa Marriott finishing in 31:23. 19 seconds clear of her rival.